are indicated by the asterisks * by the texts below. 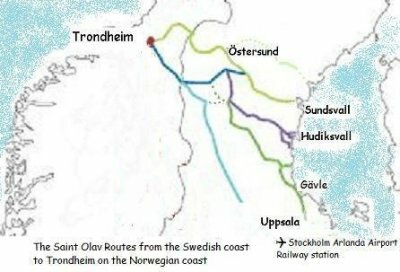 The route is signpoled from the area north of Gävle, but we plan to have it signed from Uppsala (city of Saint Erik) and north east of Stockholm, Finsta (which was the birthplace of Saint Birgitta of Sweden). It continues to the province of Hälsingland and the place where Saint Staffan, apostle of this province, is supposed to have been killed. The route connects to the route "Jämt-Norgevägen" which leads to Trondheim, city of Saint Olav. Read more on www.pilgrimstid.nu - Fotos from Helgonleden. In Swedish www.helgonleden.n.nu.